Components of the Acoustic guitar. Some of the most important varieties are the classical guitar (nylon-stringed), steel-string acoustic guitar and lap steel guitar. 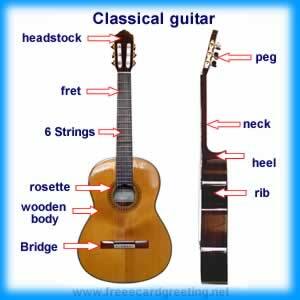 An acoustic guitar can be amplified by using various types of pickups or microphones. The most common type of pickups used for acoustic guitar amplification are piezo and magnetic pickups. Piezo pickups are generally mounted under the bridge saddle of the acoustic guitar and can be plugged into a mixer or amplifier. Magnetic pickups are generally mounted in the sound hole of the acoustic guitar and are very similar to those found in electric guitars. An acoustic guitar with pickups for electrical amplification is known as an acoustic-electric guitar.